In May 1965, when I was studying M.Com, one day I had the luck of meeting Shri Babaji Maharaj on the university road in Babunagar, Jaipur. It was evening time and Shri Babaji Maharaj was taking a stroll with 4-5 students. Since I had respect for saints, I expressed my salutations to him; to which he asked me to come to Sultan Ruhela’s house in the evening. However to my bad luck, I couldn’t go that evening. Later on in November 1965, to my utter surprise, Shri Babaji Maharaj came to the house I was living in. Those days I was studying M.Com (final). I was sharing the house with another student, from Mukundgarh, who might have known Shri Babaji Maharaj. But Shri Babaji Maharaj came into my room and took the seat. He told me that he came to visit the student from Mukundgarh, but Babaji left the place after speaking to him only for few minutes and asked me to accompany him. That time I was only wearing pyjama and an undershirt with no slippers or shoes; however, without being aware of what I was dressed in, I started walking out with him. One of Shri Babaji Maharaj’s disciple had a timber factory and shop, about half a kilometre from my house. We reached there and I sat in front of Shri Babaji Maharaj in that shop. I clearly remember that day, I signed a pledge on a piece of paper on 23rd November and since that day Shri Babaji Maharaj accepted me as his disciple. After that in May 1966, Shri Babaji Maharaj came to my village in Bhaktwarpura. He spent the night in Baba Nathuram’s cottage. He asked me to come over to the cottage and I spent the evening until 10:00pm in his holy company. Next day, early in the morning, Shri Babaji Maharaj left for Jhunjhunu on foot. After about 5-10 days when I went to visit Shri Babaji Maharaj in Posani, he told me that to see me he had travelled 20km on foot the other day. Shri Babaji Maharaj never asked students to buy tickets for him; he never touched student’s food and never touched or kept money with him. He always remained in the state of complete renunciation. 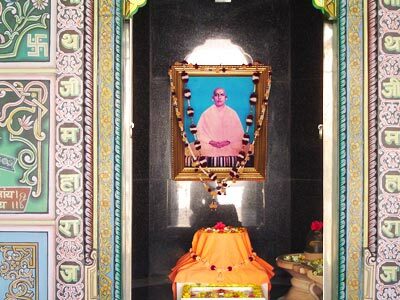 My attraction towards Shri Babaji Maharaj became more intense after my visit to Posani. By his grace, I soon found a job as lecturer in the Todi College, Laxmangarh. Since then whenever he used to visit Laxmangarh, I would visit him in the mornings and evenings. Towards the end of 1966 I was also invited to appear for the post of a lecturer in Charkhi Dadri, Harayana; when I went to seek Shri Babaji Maharaj’s permission, he said “stay in Laxmangarh only. You will achieve progress and respect here”. By his grace, after retiring as principal, I am still working in Todi College. By his blessing, I have been living with respect and dignity in the same house (provided by the college). Shri Babaji Maharaj had gifted me a set of pillow, quilt and mattress; I still have kept these as token of his fond memories. I always have been showered with his grace. Before construction of Shri Nathji Maharaj’s Ashram, Laxmangarh, I used to visit Shri Babaji Maharaj at the chudiwalon ki chhatriya (monument at the cremation ground of chudiwale) and later on at the ashram. If per chance I couldn’t go on a particular day, then next day Shri Babaji Maharaj used to say "you have come after number of years". Whenever I visited him, like a mother, he always was very affectionate and loved me. This love and affection has been priceless to me. Whenever there was prasad (offering) I was always there in the ashram. Shri Babaji Maharaj used to say with affection “how is that you can smell this (offering)?” If I went to the ashram in the morning, he would not give me permission to leave until the evening. After the evening prayers, I used to sit in his holy company until 10-11pm. Since there was immense happiness, peace and magnetism around him, I too never felt like leaving his holy company. I used to get so much affection and love from him, even more than a mother can give to her children. By his grace, my life has been very peaceful. I do not have words to express my gratitude for him. I feel as if he is part and keeper of my life. I bow to him and give my hearty salutation to him again and again. Once I was ill for almost one full year. I was suffering from tonsils, fever and stomach troubles and was not getting well. I went to several doctors but all in vain. Those days Shri Babaji Maharaj had gone to Shri Laxmanji in Dehradun. I also went to Dehradun to see Shri Babaji Maharaj. After staying for 2-3 days when I was leaving, Shri Babaji Maharaj asked me “what’s the problem with you”. When I told him about my medical problems, he asked me to see ganedi wale vaidyaji (local pharmacist) when I return to Laxmangarh. Shri Babaji Maharaj told me to ask the pharmacist for shetalopaladi chooren (local medicine) with honey and some other local medicine. When I reached Laxmangarh I immediately went to the local pharmacist and narrated what Shri Babaji Maharaj had told me. The vaidyaji said “now you will get well, the medicine is an excuse as Shri Babaji Maharaj never takes any credit directly on himself. Therefore he has chosen me as the medium”. I took the medicine and soon afterwards got well. How beautiful his ways were to shower his grace on us. When ashram’s construction was starting, there was no direct access to the ashram from the road side. I asked Shri Babaji Maharaj how he will stay at the ashram and how the disciples will visit the ashram. He replied "Shri Nathji Maharaj will take care of everything". Soon afterwards, the panditji (who owned the land adjacent to ashram) sold the land to the ashram after one incident. The land adjacent to the ashram was owned by a panditji and he had refused to sell the land to the ashram, thus blocking any access to the ashram. The panditji’s son was suffering from typhoid for over a month. One day in the middle of the night the son woke up his father and said “do you love this land more than my life”. To which the panditji replied “son your life is much more valuable to me than this land”. Son said “in which case you should sell the land to the ashram. Ashram is being built for noble purpose and you have not done right by refusing to sell the land to the ashram”. After selling the land, panditji’s son was cured completely and soon afterwards he even found a job for earning his livelihood. One day Sikar Collector, Shri Pramesh Chandraji, came to visit Shri Babaji Maharaj. He asked "why have you taken saffron coloured clothes”? Shri Babaji Maharaj replied “The one who has ordered you to be the collector has ordered me to take these saffron coloured clothes. Today I have been ordered to remain in the Laxmangarh ashram. If the order comes to leave, I will go somewhere else. Similarly today you are in Sikar and tomorrow if you are asked to go to Jaipur, you will have to go to Jaipur". When the Collector reached Sikar back, he heard about his transfer orders for Jaipur. Next day the Collector went back to the ashram and told Shri Babaji Maharaj that he has been transferred to Jaipur. Shri Babaji Maharaj said "Don’t worry. Go to come back". He went to Jaipur and after two years came back to Sikar as the District Judge. After that incident, the District Judge became a sincere devotee and used to visit ashram regularly. Similarly once Sikar Superintendent Police (S.P.) visited ashram in the evening. The moment he touched Shri Babaji Maharaj’s feet, Shri Babaji Maharaj said "Sikar is not your grandparents place". S.P. couldn’t understand and when he tried to seek clarification from Shri Babaji Maharaj, the other police officer/staff present asked him to remain quiet. That night itself the S.P. was transferred to some other place. There are numerous incidents like these which show Shri Babaji Maharaj’s grace, love, selflessness, knowledge (of everything) and capability (to do anything). He was truly God but would not let others see that. We all are blessed by having the opportunity to take refuge in his feet. It is beyond my vocabulary to express his mahima (greatness).